Anybody who has been working as a programmer knows how many disturbances can happen during the day. You can imagine things like top priority bugs, your colleague/manager wants to talk to you, social media, phone calls, … Sometimes, after the day is over, you feel like you have no control over what is happening around you and that you react on things can’t decide what is best for you. That’s because you focus on the wrong things. In that article, I want to show you great tool for increasing your productivity that is called the “Eisenhower Box”. 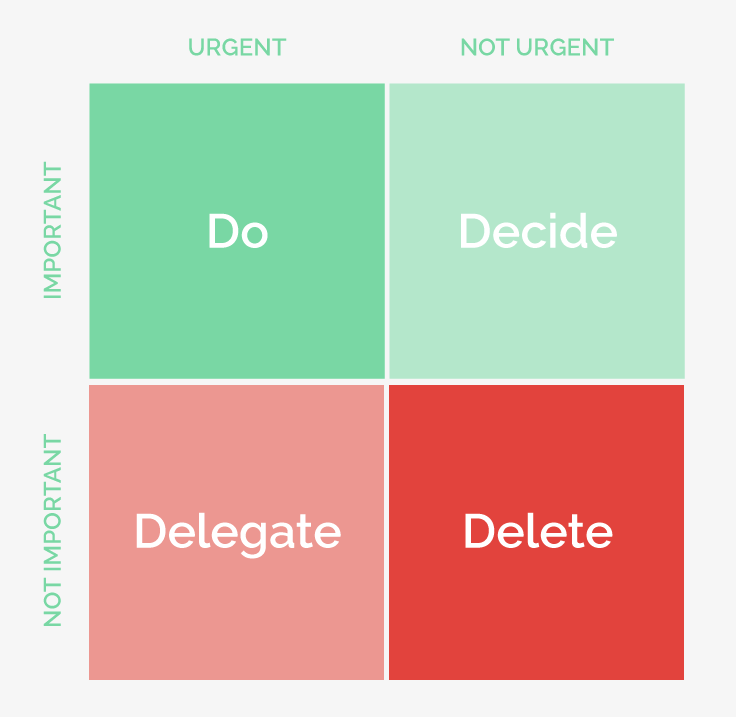 That tool will make you aware of what is important and what you should skip or delegate. The tool was invented by Dwight Eisenhower, 34th President of the United States, serving two terms from 1953 to 1961. He served as the Supreme Commander of the Allied Forces in Europe during World War II, and was responsible for planning and executing invasions of North Africa, France, and Germany. Eisenhower served as a President of Columbia University and was the first commander of NATO. He was well known because of his incredible ability to remain productive for decades. Eisenhower’s strategy is a simple decision making tool that is very useful for organizing your tasks. I would like to show how the programmers can use it in they everyday life and work. There are four possibilities to separate your actions. So every action can be attached to one of the bellow options that are a combination of being urgent-not urgent and important-not important. Beauty of that tool comes from the fact that it can be used for your professional career, everyday work, private life and daily plans. Urgent and important — do it now! It’s something that both can significant impacts us and demands our time. Procrastination is not a good choice. You can’t skip that and you should handle this as a priority. Examples: highest priority bugs on production servers, deployment failures, master branch is red on CI, Scrum meetings, your boss wants to talk to you, localhost failure. Important, but no urgent — decide when to do this, but definitely do this! This is a holy grail square. These are activities that allow us to grow as a person, programmer and part of a community. Things that are really important to us, but don’t require our time now. We can plan when to do this. Examples: exercising, learning new frameworks, reading books, learning languages, pet projects, joining meetups/conferences. These actions desire our time and want to be done now but are not so important to us. The best way to handle them is to delegate them to somebody who can do it better or faster. Examples: answering certain emails, solving hardware issues, answering letters from tax office, scheduling flights and hotels, requesting for CR. Not urgent and not important — stop doing them! You should stop doing things that are both not important and not urgent. That square is very tempting. As programmers we like to switch here many times a day because it gives us sense of doing something but also luxury of not worrying about results. There is no time pressure so we can do this for pleasure. Unfortunately these actions consume our time and are highly non productive. Examples: checking social media, watching TV, playing games, installing some updates, sorting junk mail. As we can see half of the squares (3 and 4) is about elimination and that’s the key here. We should eliminate these activities that waste our time in order to have time to focus on things that we cannot skip (square 1) and on things that develop us (square 2). Tim Ferriss says, “Being busy is a form of laziness — lazy thinking and indiscriminate action.”. We should not use time management methods and productivity methods just to plan more tasks to do. We should rather think if that activity will make a difference for me and if it will make me closer to my goals. It’s an art of elimination not multitasking that is important here. Kevlin Henney says: “There is no code faster than no code.”. Next time please think if another round of polishing of your code is really needed. Maybe it’s more in square 4 and you should rather focus on square 2. The Eisenhower box is a simple method but I try to use it on daily basis mainly to decide about elimination of actions from square 4. Also I plan my square 2 and I try to do things that are important to me. I described that in another article about how I’m going out of my comfort zone.